First things first, teaching a baby how to swim is wayyyy different than teaching children and adults. The facilities also differ. 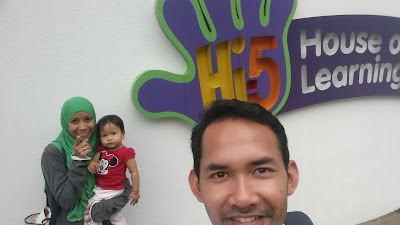 Because I wanted to expose Sofia more on swimming, when I saw that Hi-5 House of Learning in Damansara will be conducting a workshop, I immediately signed up. And to make it more fun, I invited two other friends to join. My two friends back in uni. Lifeguard friends. 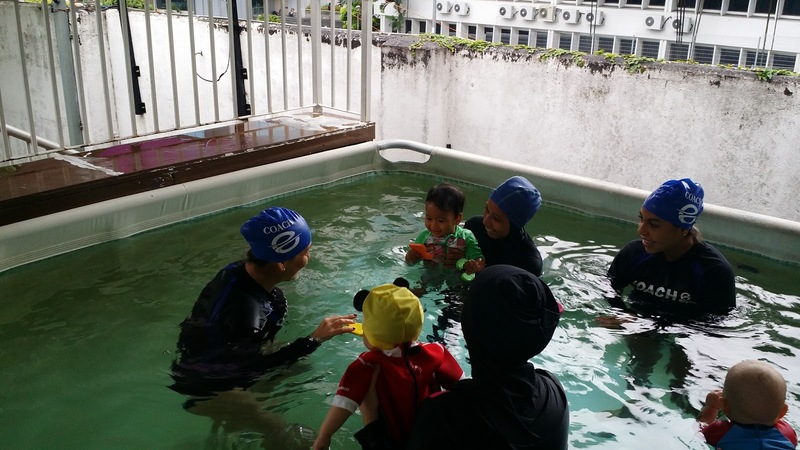 The 'How to teach your baby to swim' workshop was conducted on 28th August 2017. It consisted of a 30 minutes talk and a 30 minutes session in the pool. 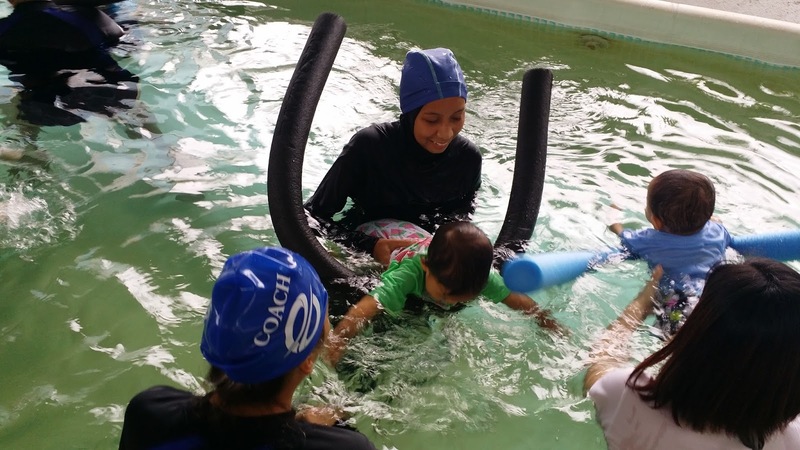 Pool session involved one parent per child. The 30 minutes talk was very useful and I, despite being a swimming instructor myself, learned a lot of new things. The talk was given by Erika Peres, the owner/ founder of EPS Academy. She has a qualification in Children's Physical Development. We were briefed on the do's and don'ts, and also some exercises (in the water) to do with your baby. Their last meal should be at least 1 hour and 30 minutes before the swimming lesson. 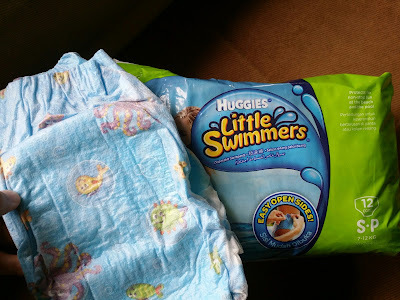 Get them to wear swimming diapers during swimming lessons. As for me, personally, I prefer the Huggies Little Swimmers. It is disposable. Prepare food or snacks for them to eat after the class. As for Sofia, she drinks a lot! If not, she would get cranky. So I always prepare juice (usually watermelon juice, purely watermelon only okay, no added sugar) for her. Swimming attire. No need to get them those with built-in floaties... And that said, no arm floats or neck floats required. 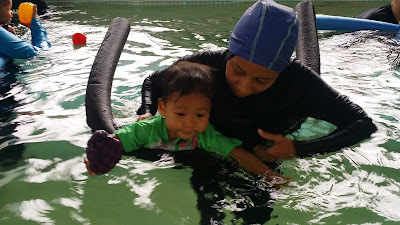 Oh by the way, speaking of neck floats, did you know that they are not recommended for babies by swimming experts? The neck float will restrict their movement and plus, floating vertically is not a natural position. Be supportive parents. Your reaction is very important! If the baby sees that you are happy inside the water, they will be happy too. Even if they failed to do the exercises (or choked a bit of water), do not panic. Okay you can panic, but do not let them see you being panic. Get it? Just smile and tell them it's okay. So, as I mentioned earlier, there was a 30 minutes pool session. The main thing I was worried about is Sofia not following instructions and simply doing her own thing; flapping, splashing, and kicking about... Like, just doing whatever she was used to doing at our pool. But... SHE DID GREAT! She followed the coaches' instructions. There were two coaches; Erika herself and Amanda. The exercises were accompanied by nursery rhymes. Some of them were; if you're happy and you know it, row row row your boat, twinkle twinkle little star, and humpty dumpty sat on the wall (only Sofia gets to do this one hehe). Repetitions is the trick in getting them to remember each movement. Swaying Sofia from side to side while singing along 'Row row row your boat'... You can tell from her face that she was happy. Looking at this picture, I was wondering now was I supposed to hold her facing me or facing outwards? Hahaha... I figured it was best for her to face me, though. A very happy mommy and occupied baby (my two lifeguard friends and their baby also in the picture). The babies were busy collecting alphabets. They spread out lots of things in the pool for the babies to take; plastic fruits, foam alphabets, rubber duckies... Point to the objects and let them move towards it while encouraging them to move their arms and legs. Hold them in between their armpits. Teachers' pet? Hahaha... Sofia definitely got a lot of attention from her two coaches. 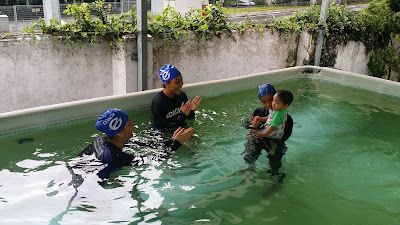 Ever since the tap tap tapping exercise, which Sofia did very well (she always 'flaps' in the water), they started to get excited, wanting to try everything on her. They taught her to do bubbles; blowing on the water surface with her mouth (something my mum and I already taught her actually...). Expecting her to blow bubbles from the nose would just be too ridiculous. For kids usually we would just start with blowing bubbles with the mouth. Sofia managed to do it few times. Good job, Sofia! And so they thought Sofia was ready for a DIVE. A dive is when you let them submerge inside the water- whole body. There is a trick to that; blow to their face and they will hold their breath. That's when you submerge them inside the water quickly. Such an active baby you can see her face so wet... So the coach told me to stay closer to her and kepit the noodle myself. Oh by the way, you can get these water noodles at Decathlon, but the ones we used at Hi5 are from MadWave. The ones at Decathlon are slightly shorter and smaller. And, it's the Twinkle Twinkle Little Star time! If there's one thing that Sofia couldn't really do, it is the backfloat. Tried to do it before with her at our pool but she just couldn't stay still. Seemed like she felt ticklish of the water getting in her ears and like they said, it is a new sensation for her. Eventually, she'll get used to it. I couldn't get her to lie down. Hahaha. Why should I look up? I want to get in the water, mama! Oh. Sofia was so lucky to get EXTRA LESSONS! She got to stay back when the rest already left the pool. 2 to 1? Two instructors for one student! Lucky girl. Erika tried to make Sofia do the backfloat and they then proceeded to another exercise; getting into the pool from the side. For this exercise, they sang the humpty dumpty one. 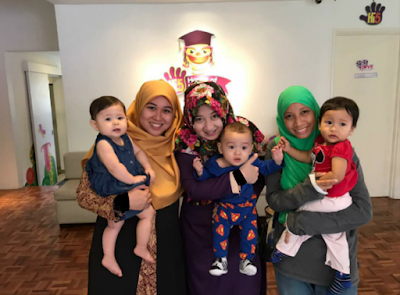 I used to sang Humpty Dumpty to Sofia back at home, at the part 'Humpty Dumpty had a great fall' (my version is 'big' fall instead of great, ah wutevs), I would push Sofia down and she would fell on her back. We did this many times already that by the time I sang this, she would fell down on her own. 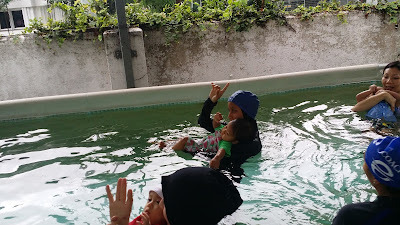 So when they put her to sit on the edge of the pool on her own, the three of us inside the pool, I kept on praying hard, please don't fall backwards please don't fall backwards... Huh. I shouldn't have worried. Knowing Sofia, air depan mata, tak kan nak jatuh kebelakang... So confident, she jumped straight into the pool. Ceh. And that was the end of the lesson. Sofia as usual, was reluctant to get out of the pool. We got her out anyway and immediately wrapped her with a towel. Since all toilets were occupied and Sofia was already shivering; it had been raining earlier so it was quite cold outside the pool, I didn't rinse her off. We just changed her clothes- tshirt, long pants, socks. Basically the same attire she wore before the class. I brought along a fancy dress but I wanted to keep her warm first. My husband got her something to drink and eat while I changed clothes. We went for a quick lunch with my lifeguard friends at Mid Valley afterwards. 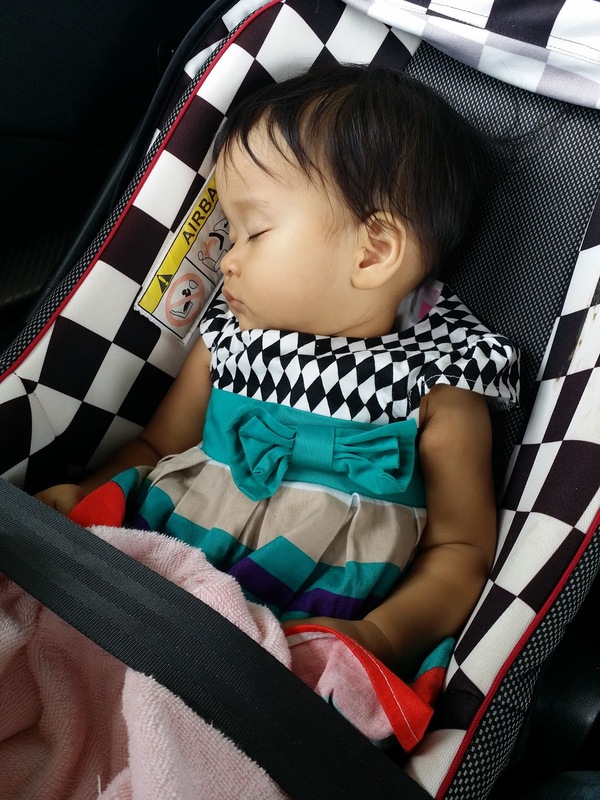 Only changed Sofia's clothes in the car. Sara, Muhammad, and Sofia dengan mak masing-masing. 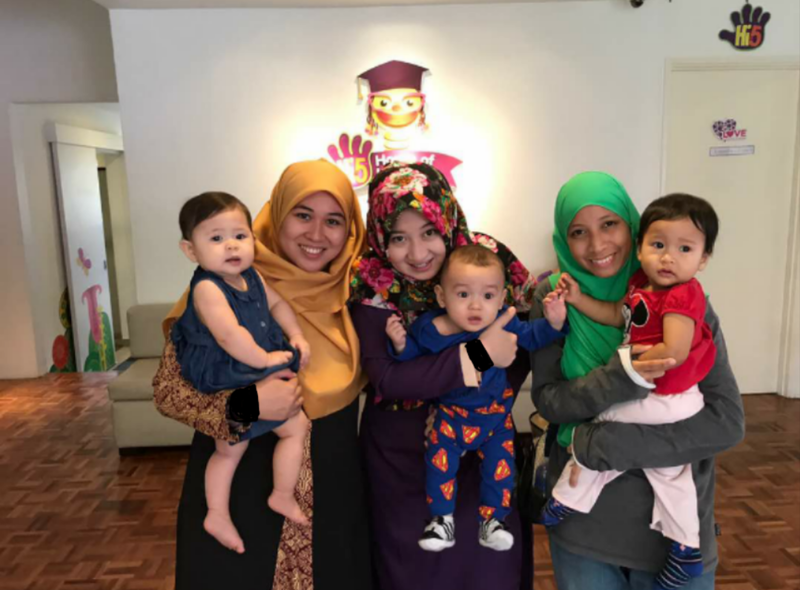 Cute kan Sara? Salute to her mummy. 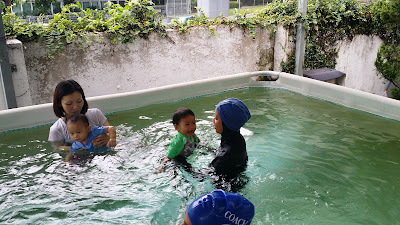 Sara cried most of the time during the pool session, but her mummy didn't gave up. So patient and calm in handling her. Mummy Sara said maybe she's sleepy, not enough sleep the night before. Because Sara loves swimming. Well, that's one thing to consider. There are days your baby can learn a lot, and there are also days they just don't feel like it. Just be patient and keep on trying. 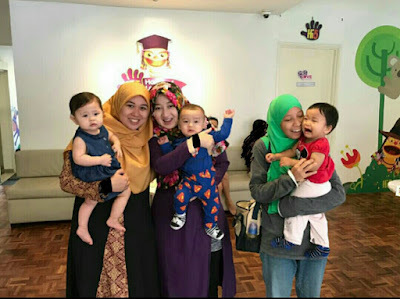 Sebelum picture perfect tu... Sebenarnya Sofia dah mula cranky. Family selfie at Hi-5 House of Learning after the workshop. Okay, details on the class. For the workshop, I only paid RM 30. I'm not sure when or if they will conduct another workshop. 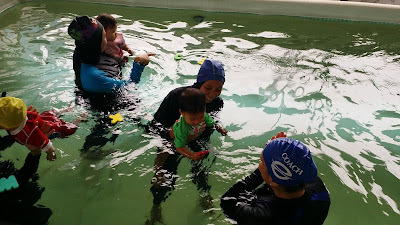 But, the swimming lesson itself is RM 200 per month, basically for 4 lessons, once a week. No replacement class. After the workshop I gave them a call to inquire on the lesson and they gave me one free trial class, which we went and the class was cancelled due to dirty pool tu. I guess there's no replacement for that either since up til now I still haven't received a call from them. Anyhow, since there will be no replacement class, I'm still finding time when to start her lesson. BUT, I'm also thinking to teach her myself. Heheh. If you're planning to do those exercises on your own baby, always bear in mind, safety first. And make it fun. And it also doesn't really matter if you want to sing a Malay song; enjit-enjit semut or ada sekor anak tupai, just keep it consistent. There, my little swimmer fast asleep.